It’s been sometime since I was able to last hit the water. Finally with zero plans for the weekend I decided to head out on Sat with some friends. Well a cold front blew in that early morning and had wind gusts of 34mph. So I reluctantly postponed to Sunday. Thanks to daylight savings I now have to wake up even earlier to get on the water before day break. Sunrise was at 6:20am so by the time I arrived at the launch site it was already daylight. I jumped in my kayak and made a paddle for the long bar thats parrallel to the ICW. Conditions were great with hardly and wind and calm water.I quickly got to my location and started throwing an Xrap11. 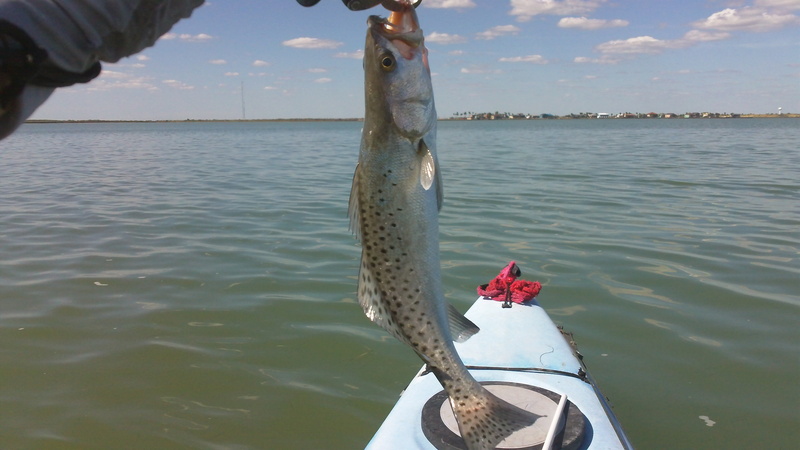 I had several blow ups but not takers so I changed to a popping cork with some gulp shrimp. 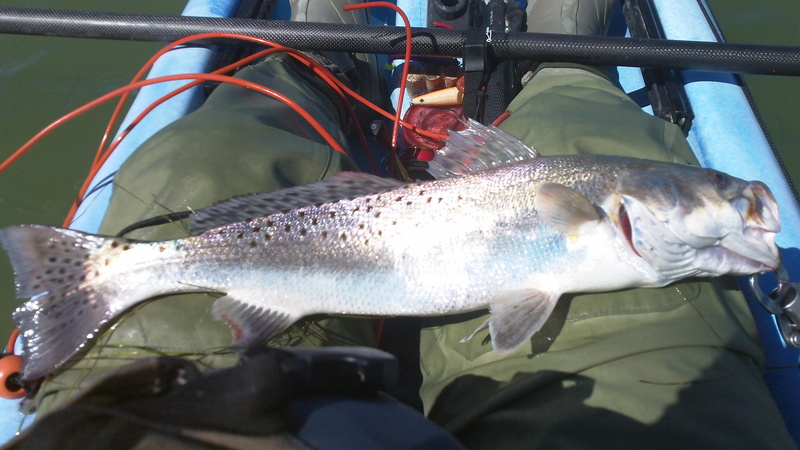 I moved off the bar and into the transition area to the ICW and on my first cast I landed a small trout. So after having found the fish I switched to a soft plastic to fish deeper in the water column and hopefully pick up some bigger trout, I started throwing a Kelly Wiggler in Purple with Chartruse ball tail and startend catching trout after trout. Many were under-sized. In fact most were but I did manage 2 keepers with another 1 literally slipping threw my hands. The fishing was tough though. The action stopped after about 9:00am and went dead. I moved back into shallow water to work the birds which were feeding with no success. So I decided to fish it slow and do some wading.I figured I would walk down the bar and cast into the ICW with hopes of finding some activity. At 10:30 the bite turned on and I started landing trout again. It seems that the tide had finally made its way to the south-side of Port Mansfield. Every 5th cast I was rewarded with a small trout. under-sized trout. Lots of them just like this. Although indeed rewarding there was no 15+ trout in the school. After working the trout over for and hour I decided to call it quits. 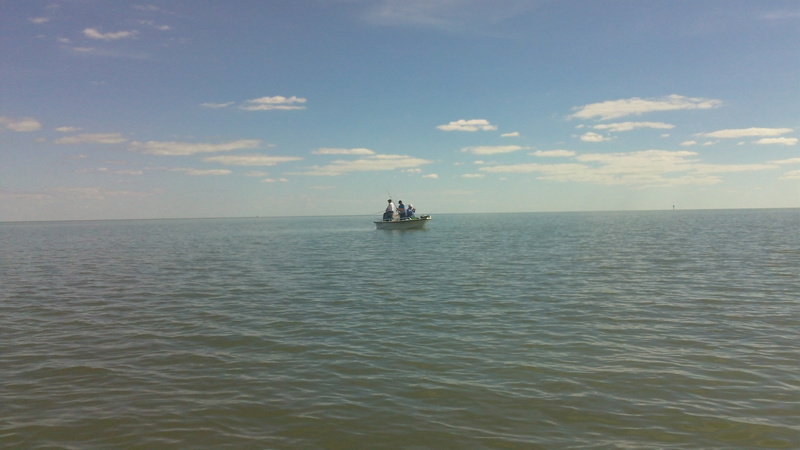 Before leaving I decided to work a small pocket in the same general area I was wade fishing. 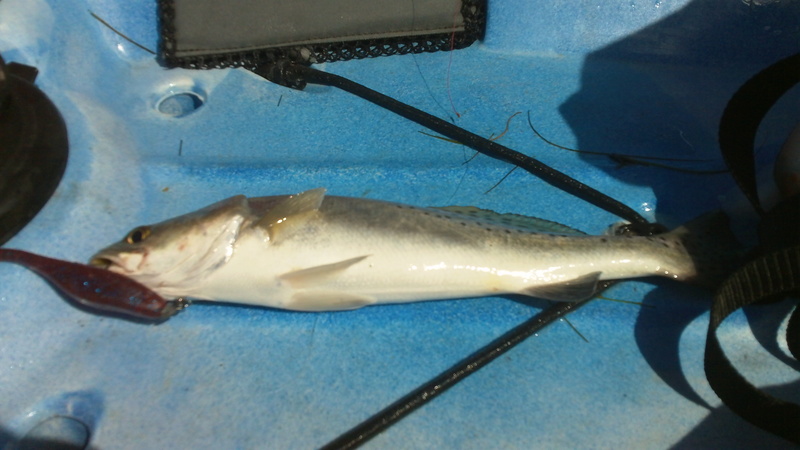 I landed more small trout but this time I was greeted by a 15ft Kenner boat with 3 Winter Texans on it. They had been watching me catch fish and decided it would be a good idea to drift in and fish right on top of where I was. This is a personal pet peeve of mine and so I had to leave before commandeering the boat and dropping them back off at the dock. So I snapped this photo on my way out. Lack of etiquette on the water. Fishing right on top of me.